In 2019 ACER is offering a suite of accredited PAT Professional Learning courses for leaders and teachers of primary and secondary schools. Each course aims to assist schools to progress through an effective implementation of PAT, starting from the school’s current experience. On successful completion of each course, participants will receive an ACER certificate of achievement. 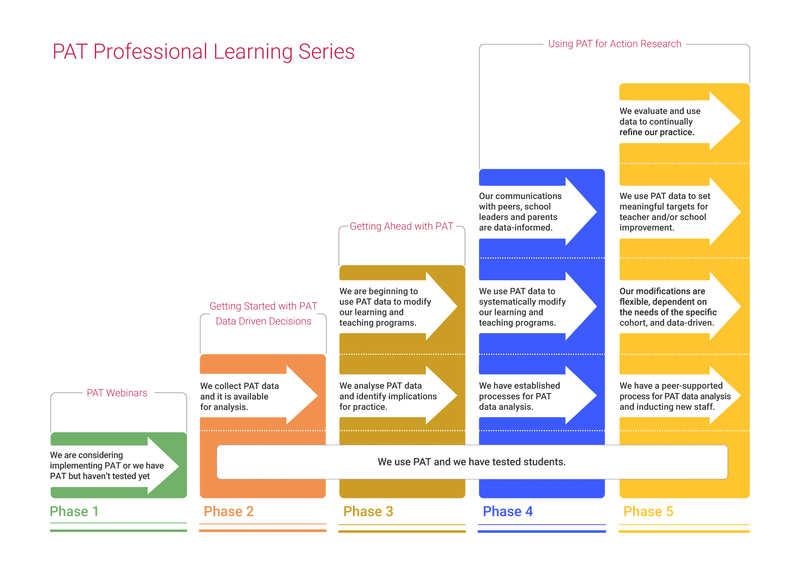 A new ACER course Using and interpreting data in schools complements PAT Professional Learning. ACER is offering a series of courses to cater to schools in different phases of their PAT Professional Learning journey. The PAT Phases guide can help you assess your progress in implementing PAT testing across your school. Use the guide to find the appropriate course to help you take the next step.